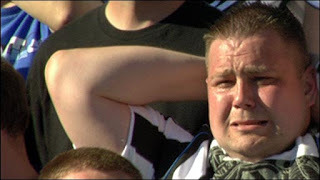 One of my most miserable moments watching Albion in recent times was February 2008 when we lost 2:3 to Newcastle and it was curtains for any remote chance we had of staying up. We were awful Newcastle were hardly better but they got a crucial win. Trooping out of the East Stand I knew we were doomed I really didn't need a couple of thousand Geordies pointing out the fact with glee. Much good it did them at the end of the season they were relegated and I was not entirely heartbroken. Since then we have had the better of a couple draws and beaten them the Cup. However today was payback and I was quite happy to see the delusional Geordies sent packing from the Hawthorns on the wrong end of a 3:1 scoreline. It was a comfortable we barely needed to get out of 2nd gear, Newcastle were poor but the Baggies were quite brilliant in possesion at times with Brunt hugely influencial in midfield. Scharner and Tamas shut out Carroll at the back and Odenwingie was clinical in front of goal end result mission accomplished. We now sit comfortably in 8th with 22 points and looking forward to 2 local derbies between now and Christmas. Things are looking good for the Baggies but just to spoil my day the idiot Savage has just declared us as safe on MOTD2. Not until the points are in the bag is anybody safe, least of all West Bromwich Albion. Hughton has been sacked by Newcastle. Do they have a death wish? Seriously they are a promoted team 11th in the table with a string of decent results under their belt what did Ashley expect? Shocking decision could undermine the progress that they have made since the relegation of 2 seasons ago. Well heres hoping.